It wasn’t that long ago when people started to use their outdoor Christmas string lights to illuminate their yard year round. In fact, string lighting has grown so fast in popularity that now there are all kinds of string lights to choose from and you don’t have to wait until the holiday season to find them; string lights are easily accessible on line or at hardware stores. A larger store like Home Depot or Lowes will have a greater selection, but the small stores have options too. Studies show that outdoor lighting can actually deter crime because criminals can be seen. So simply adding lights can protect your home. If you have a home security video system in place, or you’re considering one, you’ll need to ensure you have proper lighting in place and string lights are a perfect solution since they are easy to install; all you need is an outlet and something to hang them off of. 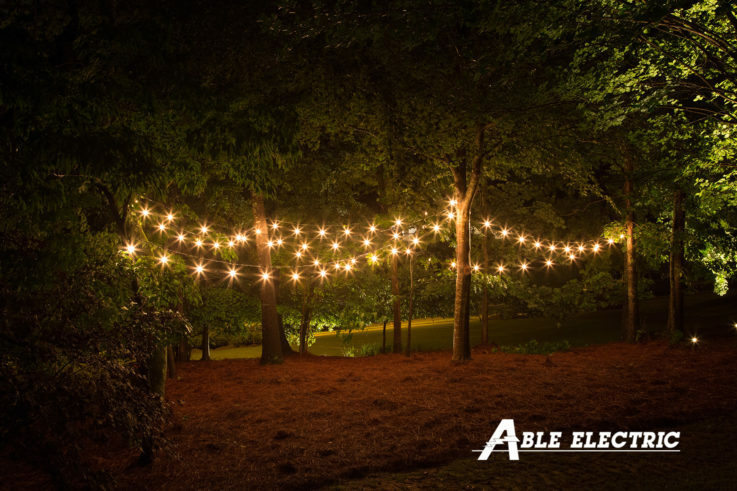 Often times string lights are strung around a patio roof, but they can also be run along a fence line, around a gazebo or even hung in the trees. Controls can even be put into place to allow the lights to come on at night when movement is detected. There are other benefits to this lighting though as they provide an excellent way to beautify or add a creative flair to any yard. From rope lights, to vintage style bulbs and even lights with stars around the bulb are available. There’s even LED color changing bulbs! Looking at product reviews, I would encourage a quick read of reviews for the product you’re considering, which I found several just on the Home Depot and Lowes websites. Though most reviews are positive, some of the specialty bulbs are difficult to find or expensive to replace. One review said it was actually cheaper to buy another new set of lights than replacing a single bulb! So specialty bulbs can create a bit of a hassle if you don’t do your research. Buying a more expensive set of string lights for one of the products I researched actually took care of finding a replacement bulb because it came with extra bulbs while the cheaper set did not. Additionally, the resounding recommendation from product reviews is something we all know, but tend to forget when making a purchase… you get what you pay for. So don’t be afraid to spend a little extra on your lighting because you can still buy higher quality without breaking the bank. For most 24 foot strands, you’ll pay about $30-$60. There are many more outdoor lighting ideas we would love to share with you, and Able Electric can design and install your entire outdoor living space lighting plan! Give us a call at 530-644-0977 to set up a consultation.